Is remodeling a house on your own possible? Many who first attempt to remodel a home may have little understanding of the process, techniques, and rigors that will be involved. Even professionals who work in the real estate industry as agents and brokers may have limited knowledge of how to get started. Picking up guides and reference material on this topic can help frame what remodeling a home will entail. The Reader's Digest Handyman Repair Book, for example, explains the kind of tools to buy and gives detailed instructions on a variety of repairs. This includes learning how to unclog a sink, replace a receptacle, patch up a hole in the wall, and even frame a closet. Remodeling a home on your own is possible with a little research and some hard work. Proper preparation can save you precious time and money on mistakes that could be avoided. There might also be more efficient wants to get a project going than you originally believed. Study up before committing to any major action. Buy books on home remodeling and maintenance. Talk to contractors and handyperson specialists. Tour recently remodeled homes for clues and ideas. Go to home improvement shows. Think before moving furniture so that stacked furniture doesn't block exits. Rolled carpeting is very heavy to lift. If you throw carpet out a window, you will scratch the window ledges. It is better to leave a path to the door. Finishes vary and affect the price of finishing floors. Oil-based polyurethane has an amber hue and is very durable. Water-based polyurethane is clear and easy to clean up. Polyurethane finishes require three coats minimum. It costs less to mix your own mortar and grout. Never mix more mortar than you can spread in 30 minutes. Adding latex to thinset helps strengthen the bond. Always wash tools promptly and dry them. The back of a toothbrush helps to smooth uniform grout lines; if you use your fingers, they'll be raw. Buy big sponges, rinse often, and squeeze dry when wiping grout film. If you are cutting only a few tiles, you'll save money if you take your tiles to the store to be cut. That's a better approach than renting a wet saw. Always turn off the electricity to the house from the main switch. Don't rely on a circuit breaker; turn it all off. Buy an electrical tester. Testers cost about $10. Always make sure that no current is running through the wires. Black wires are hot, white wires are cold, copper wires are neutral. Needle-nose pliers can twist wire nuts if your fingers are too sore. Always make sure your wires are secure and tight inside wire nuts. Just because screws and plates come in the box doesn't mean you can't use what is already in place in the ceiling. Remove your existing light fixture before buying a fan so that you can be certain the new mounting hardware is large enough to cover the hole in the ceiling. Do not use a paint tray. Instead, buy a 5-gallon bucket and paint screen. This way you won't accidentally step in the paint. Mix together all your cans of paint of the same color, and pour the paint back into the cans. This ensures uniform paint color. Buy quality paint brushes. You can't spend too much money on paint brushes. Thoroughly clean brushes with a wire brush immediately after use, and let dry before storing. They will last a lifetime. 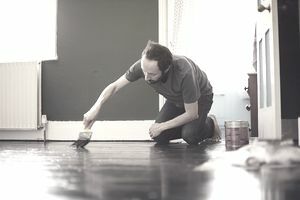 Lightly sand between coats; use 150-grit or higher. This removes burrs, defects, and any grain that rises. Always do two coats of paint. Paint under bright lights so that you can see drips. Test all paint colors first. Take an extra day to fix painting "mistakes" where paint has dripped or dribbled on other surfaces. Wear old clothing, cover your hair, and wear latex gloves. A dated home that still has a solid frame can be refurbished and sold for a profit if you plan and budget wisely. Even if selling a remodeled home is not the initial intent, the profit that it generates for the seller can lead to larger acquisitions in the future. Keep learning about what next steps are.